Less invasive approaches to total hip surgery can be advantageous to patients due to the reduction in soft tissue trauma and the potential for earlier recovery. 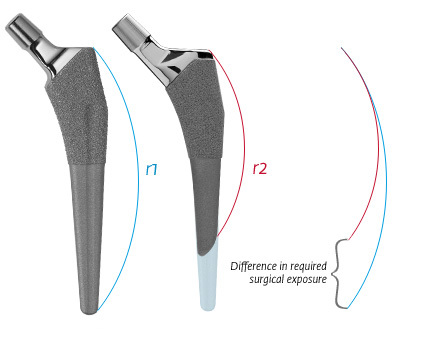 However, these techniques necessarily result in a surgical window with restrictive geometry which can complicate insertion and placement of traditional length femoral components. 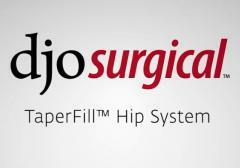 DJO Surgical designed the TaperFill™ femoral stem with a shortened overall length and an anatomically congruent, Tri-Taper profile to ease insertion, prevent subsidence and achieve stability. Anthropomorphic data, constructed from CT scans of male and female femurs, was used to determine optimal stem design and AP growth. A 12 degree proximal taper (1) provides inherent fixation and rotational stability through increased surface area contact with cortical bone structures. 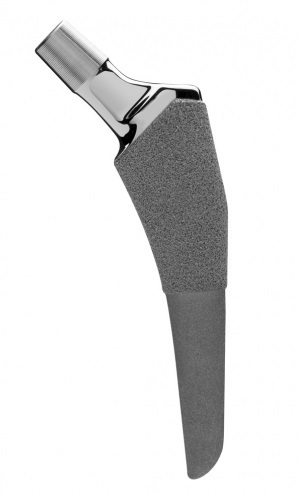 A 4 degree distal taper (2) reduces the possibility of stress shielding and helps account for proximal/distal mismatch. 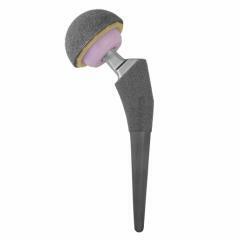 The ML taper (3) of the TaperFill™ stem is identical to DJO’s Linear® Hip stem which has demonstrated over 17 years of clinical success. The average incision length of a standard total hip was traditionally 22cm long. 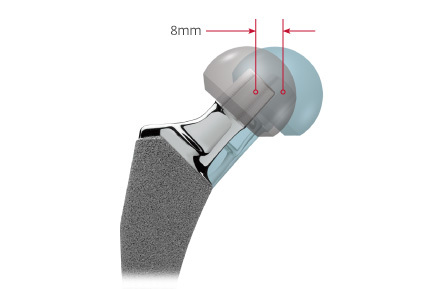 The surgical window for less-invasive techniques is anywhere from 5-10cm. A shorter stem allows easier insertion into the bone without stressing the muscles, potentially causing undue trauma. 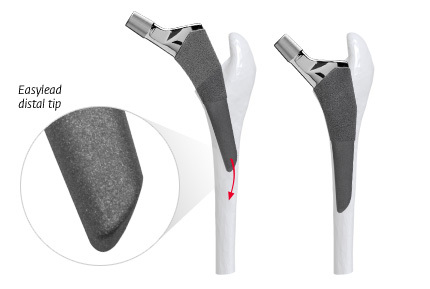 The proximal lateral shoulder of the Taperfill™ hip is reduced. 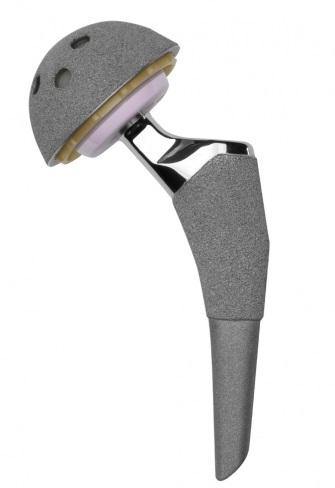 This, along with the overall shortened length of the stem, further facilitates the implantation of the stem in less invasive techniques and helps avoids varus implant positioning. 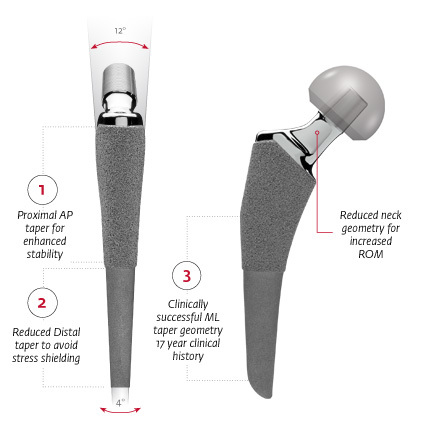 The EasyLead™ beveled distal tip helps ease implantation, protect the lateral cortical bone, and facilitate final positioning. 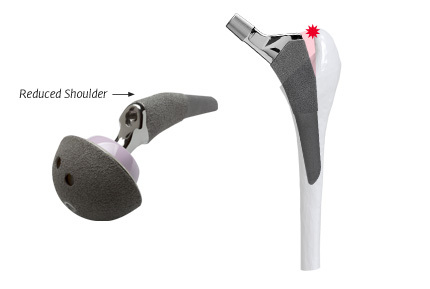 This feature is incorporated into the TaperFill™ system’s broaches and final implants. 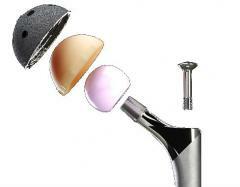 The TaperFill™ Hip System features standard and direct lateral offsets options for optimal patient fit. An extensive size range (14 sizes) and consistent size increments help achieve the best implant fit with the optimal offset. 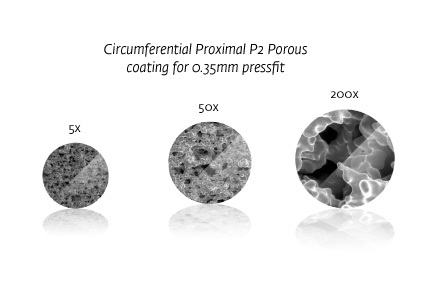 P2, a new proprietary Titanium Porous coating by DJO Surgical, is the first porous porous coating in the world wherein the non-spherical bead itself is also porous – giving it its name, P-Squared (P²). Consisting of variability in pore sizes, very similar to a “lava rock” type of structure, P² aids in the apposition of bone for superior in-growth results. TaperFill® is compatible with DJO’s advanced bearing surface options. HXLe+ provides all the wear advantages of highly crosslinked UHMWPE without the reduction of material strength. HXLe+ is a proprietary blended resin that neutralizes the negative effects of free radicals, negating the need to re-melt or anneal the material after cross-linking. 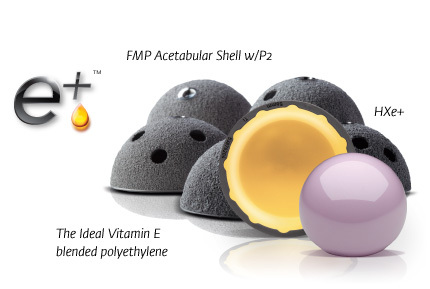 Biolox Delta Ceramic heads are available in sizes up to 44mm. Send us note! We always welcome questions or comments.